The Environment Agency has announced a set of new supplier arrangements and partnerships which will increase efficiency, value for money and the green legacy of its £2.6 billion capital investment programme. The programme aims to better protect 300,000 homes from coastal erosion and flooding up to 2021 and beyond. Effective from April 2019, the Environment Agency’s Next Generation Supplier Arrangements (NGSA) will form the basis of new ways of working which will help better protect people and the environment whilst ensuring that sustainable development is at the core of Environment Agency projects. 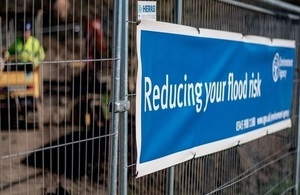 The new NGSA arrangements have been developed using the EA’s long experience in the Flood and Coastal Risk Management sector as well as learning from other leading public and private infrastructure providers. The new arrangements promote innovative ways of collaborative working with delivery partners and local communities from the initial planning stages of a project right through to its completion. The new supplier arrangements will also lead to longer term team working and new ways of engaging with local organisations and communities. This closer working will ensure that homes, communities and businesses are receiving the best possible flood and coastal management for the challenges facing their area. At the same time flood and coastal defence projects will promote economic growth, social wellbeing and will seek to enhance levels of natural capital within the local community, making sure that each scheme brings long-lasting benefits for future generations. The new arrangements are also a major step forwards for delivering low carbon solutions for projects which will help the EA work towards the Government’s commitment to reduce carbon emissions by 80% by 2050. The NGSA arrangements run through to 2023 with the opportunity to extend to 2027.